It’s an understandable question. Certainly restricting ourselves to candidates that had been analysts before would both help whittle the applicant pool to more manageable levels and shortcut the onboarding process substantially. But our goal in hiring isn’t to narrow our funnel or make the onboarding process shorter: it’s simply to hire the best and most talented candidate for the job, whoever they might be. It’s certainly possible that that candidate is or has been an analyst, but given a choice between a single type of candidate and the field, the field is always the safer bet. Our hiring process, then, is designed to do nothing more or less than produce the best possible candidate for an analyst job with RedMonk. It has an interesting and wonderful side effect, however. When we take bright individuals from different roles or industries and let them show the technology world what they can do, they open up brand new opportunities for themselves from a career perspective. One of the things that tends to happen when you identify talented people is that others notice. They begin to see the raw talent RedMonk perceived in these analysts during the hiring process. RedMonk analysts, therefore, tend to be sought after assets, as it should be. Which brings us to today’s bittersweet announcement: Fintan Ryan will be leaving us a week from Friday. Fintan came to us with no experience as an industry analyst, but leaves RedMonk having done truly excellent work in that capacity. This was no surprise to us, given that the materials he submitted during our evaluation left little doubt he could handle the job. He’s taken to the role quickly, and from his quantitative research to his quiet, understated manner to his work making events like ThingMonk special, he’s been another fantastic hire for us. He will be missed, by our community, by our clients and by those of us working at RedMonk. That may help explain why when Fintan came to us and said that he had the opportunity to take a job where among other things he’d have a much lower travel load, we understood. Even if we didn’t like the news, even if we were disappointed to not have the opportunity to continue to work with him and help him grow, we understood and we supported his decision. We won’t spoil the details of his new role here, as that’s his news to share in his own time, but suffice it to say that you’ll be hearing from him still. As saddened as we are at losing Fintan, however, that’s how excited we are to see who’s next. We’ve been extremely fortunate to have some truly incredible applicants for our open analyst positions over the years – some of them have literally shocked us – and we’re hoping for our decision to be equally impossible to make this time around. Why work here? The next great RedMonk analyst will be joining us at a time of incredible opportunity. 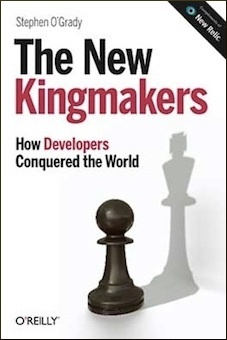 Our hypotheses around the importance and central role of developers, once regarded as controversial and crazy, are now literally part of the onboarding process for IT staff at enterprises that understand that software is eating the world. Meanwhile, the technology landscape has never been so fragmented, so desperately in need of assistance in helping to make sense of the aggressively more complicated choices that need to be made. RedMonk remains, in my obviously biased opinion, an amazing place to work. There aren’t many too many jobs available that allow you to influence the strategic direction and decision making process of some of the biggest and most important technology companies in the world – as well as their disruptors, that give you a pulpit to produce public research for some of the best and brightest developers on the planet. Fewer jobs still let you work on things that are important, things that improve the day to day lives of developers, and by extension, the users they service. Tim O’Reilly says to “work on stuff that matters“; we think we do, almost every day. And as you might guess from conferences like the Monktoberfest, we try and have fun doing it. Add in the flexibility that working for a small firm offers, from the ability to define your own research agenda to good hardware to variable vacation time to our commitment to putting your family first, and it’s a damn good gig. If any of that sounds interesting to you, drop us a line. Who will we hire? The best fit we can find. As always, we’ll follow in the Moneyball A’s footsteps, in that we’ll think creatively about the opening; we’re already in the process of talking to some interesting candidates. That said, we’re open to all interested parties. Fair warning to all applicants: we are very picky. You need to be able to communicate effectively, write well and be committed to rational discourse. You should have a reasonable online presence and a passion for developers and the tools they use. Other things we’ll look for include programming skills, economics and statistics training and experience with rich media. If you think some or all of that describes you, or someone you know, here’s what we’re looking for and how to apply. You will have big shoes to fill, whoever you are. The analysts that have come before you have done some incredible work, and we expect nothing less from you. Last, to our clients and customers: if any of you have questions about this news, feel free to contact myself (sogrady @ redmonk.com) or James (jgovernor @ redmonk.com) if you like, or Juliane (juliane @ redmonk.com) as always. We’re happy to answer anything we can. Ave atque vale, Fintan, and we look forward to seeing who will step up in your place. Stick to your own recruitment approach Steve. It has served RedMonk very well for years -attracting incredibly talented and bright, engaged people that we all love to engage and work with and have learned so much from. Looking forward to seeing who will fill those big, bright shoes!